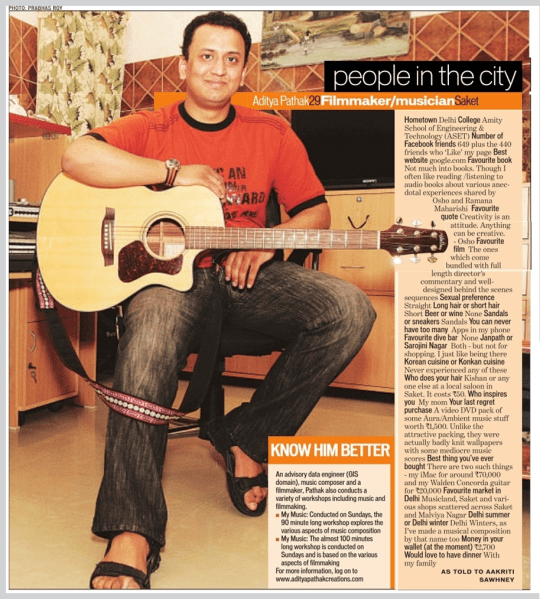 Aditya Pathak’s sheer passion for all things music led him to build himself a well equipped home-studio where he creates music and also short films. World Fusion and New Age genres inspire him which he combines with textures and ambient soundscapes that represent real-world and imaginary “spaces”. It is here that the background scoring and theme music for a Malayalam short-film called Inganeyum Oru Katha developed which was later released in Singapore. “Being born and brought-up in the Delhi culture this was my first exposure to create an urban, peppy yet traditional composition with a strong South Indian influence, truly unique.” The music was well accepted by the film-maker and Malayalam audience both locally and internationally. Most of his video works, live sessions and lectures are created for Expressions India, where he works in the field of life skills enhancement and wellness of adolescents and youth. During his college days, Aditya had the opportunity to play rhythm guitars for his uncle’s All India Radio recordings and then for his bhajan album. Tremendous support from his family and dedicated weekends spread over 12-13 months, led Aditya to gain expertise in studio controls, music productions and basics in film making. Success came in the form of an International Diamond award presented by his firm, Pitney Bowes Software. Being the youngest employee across the globe and the first one ever from the Indian offices to bag this prestigious award made it all the more special. Unlike the conventional routes of selling music-albums and public performances, Aditya introduced music to directly involve people in the work environment and make work life lighter and more creative. Listen to Aditya Pathak’s- The Malhaar Lounge here.